Last month I helped launch a product that did $41,000 in gross revenue. While the launch was a success, the remarkable part isn’t the amount we brought in (I’ve seen bigger launches). No, what’s remarkable is the process we used to get it off the ground. idea, protype, test, build, launch, ship, profit. They save the launch (and the profit) for the end. What if people don’t show up (the blockbuster flop John Carter)? What if people don’t buy (remember HD DVD)? What if the product / service / whatever is old by the time they finish (Wii U…you might not have heard of it)? It lets us know right away if we’re building something worthwhile (something people want and will pay money for). This is exactly what we did for our business incubator program, where we brought in $41k from the sale of an idea and a promise. And in the following sections, I’m going to show you exactly how we did it so you can do it yourself. If you read a lot of business books or are in a startup yourself, you might be thinking all we did was apply the Lean Startup to our business. While that’s partly true, it misses the main point. The Lean Startup is a process for efficiently creating a new business (Silicon Valley tech startups in particular) by reducing waste (waste of time, money, etc.) through a focus on validation (real world confirmation that our ideas are correct). Step 2 – test hypothesis: ACTUALLY send out 10 emails a day; measure sales. *bonus points for identifying side effects (in this case, probably a lot of unsubscribes and hate mail). Step 4 – iterate: Now continue to use this same structure to test ideas in the marketplace. It’s a little more methodical / scientific than that (sometimes), but you get the point. Instead of just doing things on a hunch or because something seems like a good idea, lean startups take more time to develop their ideas into testable hypotheses. The process is really powerful and is the standard for tech startups and SaaS businesses. But what if you’re not a Silicon Valley startup? What if you don’t have the benefit of seed funding to test and validate to your heart’s content? What if you have mouths to feed, real expenses to pay, and this ‘idea’ doesn’t have the benefit of yearlong tinkering? I’ve been studying lean methodology for the past couple years. When I say study, I don’t mean watching TED talks and sharing them on my Facebook feed. I mean reading, analyzing and actually applying it to my business and products. When I wrote The Complete Guide to Pay What You Want Pricing, I did something similar. I wasn’t writing just to write (that’s what my blog is for). No, I set out with the intent to create something people wanted and would pay for. I did this by finding a topic people loved (through progressively validating the idea one blog posts and guest blog post at a time) and lean launched a book back in November. Great response to my writing on the subject + over $500 in preorders was enough for me to validate the idea, so I moved forward with it and launched. When I launched Insurgent Publishing, I didn’t have a lot of money or time. I needed to validate from the beginning – otherwise the idea was as good as dead before I ever started. I progressively validated the idea by crowdsourcing the solution for our first product (as in: I got people to contribute to the first publication – The Creative Entrepreneur), launched a lean pre-sales campaign, and finally finished and shipped the journal on 1 January. Great response to crowdsourcing the solution + over $1,000 in preorders = enough to validate the idea. We wanted to apply the lean startup process to a premium product – one with more overhead (read: $20,000 minimum). Question is: would the same techniques that worked to launch a $10 product work for a $10,000 product? The Lean Launch (a term I think I just made up) takes the Lean Startup methodology and applies it directly to product development. In the same way that the Lean Startup seeks to launch a business quickly and efficiently, a Lean Launch seeks to launch a single product as quickly and efficiently as possible. For my purposes, product here is a broad term. The product we’ll be talking about in this case study is an in-person business incubation program (a product / service hybrid). But wait! How can the scope be so broad!? The Lean Launch is a practical methodology; a series of steps you can apply to any idea to sell it BEFORE you build it. Think of it like presales but on steroids, or running your own personal Kickstarter (but without that silly platform taking 30% of the profit or whatever). The point is, it is more than possible to get people to buy something that doesn’t exist. It happens all the time, millions of times a day. And I’m going to show you how it works. Or they see the benefits to selling before you build – in theory – but the idea of putting it to work escapes them. If that’s you – you’re probably thinking too much, or you’re thinking too directly about your specific situation. For just a moment, don’t think about widgets and applications and software. Instead, consider some other area like politics. The majority of people buy into what their representatives / congressmen / presidents say with their vote and / or campaign contributions. But for what? When it comes to selling a proposed product or service, same rules apply (although in my case and yours, there are repercussions if we don’t follow through…wink wink). Another important thing to consider: you’re not selling to everyone. In fact, you’re purposely NOT selling to everyone. Instead, you’re selling to a select few (very few) early adopters. Passionate early adopters. The kind of people who are already seeking what you’re building and are will to buy on proof of concept alone. Once we’ve taken these essential first steps, it’s time to create a sellable idea. For that, I’m going to walk you through section 2: the Minimal Viable Launch Blueprint. This is the same blueprint I use for every launch, from books to consulting services to conferences, to you name it. Notice how we don’t create a business model until AFTER we’ve progressively validated the idea (no sense in building a business model for every great idea you have). Also notice that it should take you no more than 20 minutes to create a working business model. 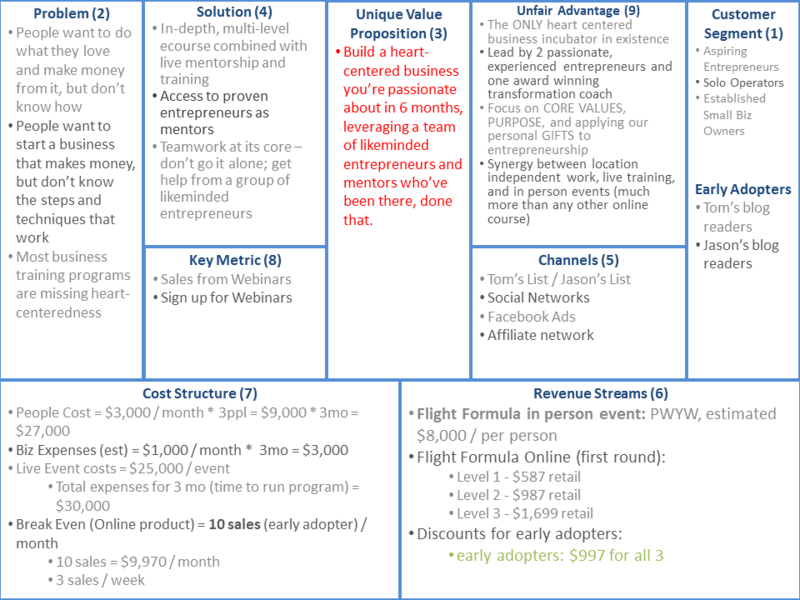 For The Flight Formula (and every project I’ve ever worked on), I use Ash Maurya’s Lean Canvas as a framework (check it out at www.practicetrumpstheory.com; and if you like this material, buy his book: Running Lean). Ash’s Lean Canvas is excellent in that it’s a one page business model that hits all the essential elements of a new (and existing) business. And it works even better when you focus on just one product or service (which is what we’re doing for our lean launch). Who is your customer? Who is your early adopter? How do you uniquely solve it? What makes you stand out from a million other solutions (including: do nothing)? What’s your solution (key features and benefits)? How will your customers find you? How can you get them to you to buy your product? What are you pricing your product at? Is this the only revenue stream (in a lean launch, the answer is yes)? What are you measuring (for a launch: early adopter sales – that’s it)? And finally: what’s your UNFAIR ADVANTAGE? What’s your GIFT or your superpower that creates your blue ocean (more on this next week – sign up for the webinar to find out more about this)? Here’s an example of the our in-person business incubator lean canvas. Barring any major issues (reference #6 and #7 above), this one business model gives you EVERYTHING you need to get started. More importantly, it lays out the core of what you’re creating, so if you’re ever stuck and wondering what to do, you can reference this business model to see if it fits. Once we have the business model, it’s time to sketch out the essential pieces. Wireframing is both art and science. When I say build the wireframe, I mean create an outline and a skeleton for the essential pieces of what you’re creating. Wireframing also means outlining the product or service itself in great detail. When it came to The Flight Formula, we created pages of organized outline. We broke things down by day, by event, by goal, etc. Having our event wireframed in detail allowed us to craft a comprehensive sales page quickly and efficiently, and allowed us to sell the idea with confidence (we knew exactly what we intended to build). If you were to look at our wireframe for the event, you’d be able to picture exactly what the incubator will be like from day 1. A meticulous wireframe is not an option. You need to wireframe out your product or service in detail so you can create your marketing campaign and sales page (if you’re using one), and ultimately: to sell your idea. Final warning: do not skip the wireframe. This part is tricky because once we have a great idea, our natural tendency is to start building everything. For our in-person business incubator program we were lucky in that my collaborators and I had email lists (all you Resistance Members out there – you’re number 1!). Between the two of us, that was several thousand people whom we had already built trust with over many months (and years in some cases). That meant, at a minimum, our sales funnel would look like an email or two to send people to a sales page and / or a live webinar. We decided to create a full-on sales page because our product was so expensive, but in many cases, creating a whole sales page isn’t essential. You can just as easily create the pitch in a PowerPoint and save it for the end of a live webinar (which is what we did that helped fill all the spots of our program). There’s no best practice for it, only things that work better for some people and for some products. You can also possibly break all the rules here and have some success. That’s cool – go for it. If you’d rather be more confident, though, I’d say use the tools and techniques that work (don’t reinvent the wheel – save your creativity for the experience and the product or service you’ll be creating for the customer down the line. *note: next article, I’m going to walk through, step by step, the process of building out only the essential pieces of our program as well as the tools we used to do it. I know the hardest thing sometimes as a new entrepreneur is not knowing where to begin or what tools to use, which is why I want to show you exactly how we did it so you can model us (yet have the freedom to change whatever you want for your own purposes). Step 7: (pre) Sell, Sell, Sell! When you read this step, I want you to picture someone on that ridiculous 80’s game show where they want big money but no whammies. In this case, you want committed early adopters and pre-orders (and still no whammies). The only way to get sales is by selling, and when you finally go to launch, you’re the only one who’s going to sell your product. If you’re an introvert like me, this will be painful the first time (or first 100 times). But there’s no way around it. Even if you’ve setup an awesome affiliate program or you have a great no-brainer product, it doesn’t matter. You still have to be the one that sells it. Then you also need to be a salesman. No, you don’t have to do anything slick. And while there might be selling skills you could learn to improve your results, I believe that’s much less important than (1) creating something of value and (2) articulating that value of said creation to people who want to hear from you. No, there are no shortcuts. If you have an idea you want to bring into the world, this is how you do it (if you want to spend more time creating things people like and less time shooting in the dark). There are obviously a lot of variables thrown into the mix anytime we begin instigating. As clear as the path to our in-person incubator program launch is to me now, it wasn’t that way in the beginning. But the reality is there was no hand-holding, no clear path, and no guarantees. We had to figure it out as we went along, accepting the bumbs, bruises, setbacks, and failures as part of the journey. In the end, it was a sometimes difficult experience, but totally worth it. I hope you found these past two articles helpful on your creative journey. This isn’t the first product I’ve shipped that’s done over $10,000 in sales. In fact, I’m writing a book on the step by step process I use to lean launch an idea from just an idea (with no money and no connections). If you’d like updates, sign up here. Started in Buenos Aires, Argentina – finished, and shipped in Santiago, Chile. Fascinating stuff, thank you for putting it all out there for free! In step 4, Step 7 says if your Sales are more than your expenses, stop. It needs to be the other way around I think. Nice. but theres simply too many blogs/products that sell ” how to blog/ how to start a business” services. Why do they work? Coz this demand never runs out. Its laced with selling a dream, hope and snake oil. Ali, skeptical. I like it. 3. I did this for http://www.publishersempire.com – presold on the promise of building a book launch platform / training platform / community. I then iteratively launched and sold subscriptions, each time increasing the price until I hit beta, where everything was built, but still in testing mode (I consider everything to still be in beta). I could give a few more examples, but you get the point. I don’t think I’ll ever launch something without getting buy in before I build it.